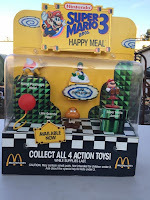 Money in the Garage: McDonald's collectibles you sell...and a few you keep. Jen- Glad you enjoyed it. Thanks...Dude! I learned new things today! What a great story. Little bit of history, along with things to sell. Glad you liked it...Dude! Love this story! Thank you for sharing it. I am glad you enjoyed it, thanks...Dude! Nice article! I learned some new things, too. Happy memories of going to McDonalds, which was a big deal for us as kids. Trips to Mickey D's were a big deal, right? My kids always loved going and getting those Happy Meals! Fun thing to do with them and it didn't break the bank. You gotta love Mickey D's! 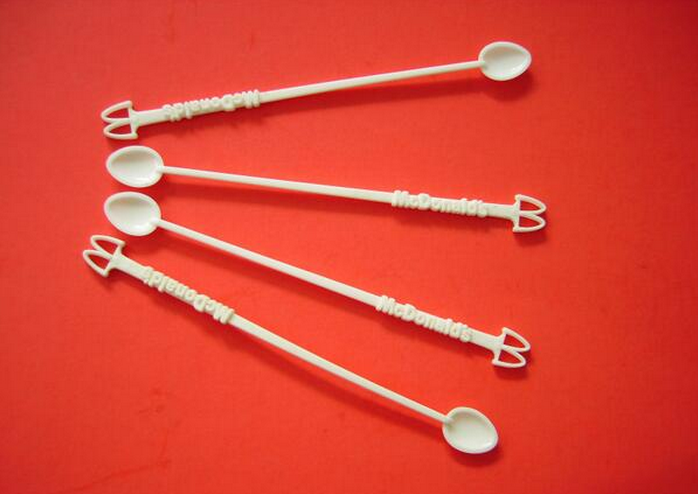 Sadly I'm old enough to remember those cool spoon stirrers! As a kid, I thought they were the neatest things. I'm sure I used a few to feed my baby dolls. Later I heard they were being pulled because of "drugs". I didn't get the connection to cocaine until years later. But we had lots of good memories of McD's as kids. It was a real treat to go. It was even better when my dad said it was ok for one of my friends to go too. Before McD's came to town we went to Carroll's. I imagine it was a big effort for a young couple with four kids to feed. My mom told me we didn't go until she started working and we always went on payday - Friday. I couldn't eat all my fries and for some weird reason I put them in my pocket (to be thrown away later). My best friend found them one Monday and.ate.them and thought they were awesome. Now if McD's would only bring back those FRIED apple pies, I would be in hog heaven. Nice memories! Like you, when I was a kid, we would go to eat on Dad's payday too. My Dad would drive my Mom to the local supermarket first to food shop, then if were lucky, we'd go to eat at either McDonald's or Gino's. And oh yeah, those McDonald's Apple pies were the best. Can't under stand why they got rid of them ? Thanks for writing in a sharing some great memories...Dude! Like most collectibles, the older the better, so Mulan may not be worth all that much (yet). If you have the mug, you could be looking at some decent money. Nascar is popular too, so that could also be of some value. Becky- Thanks for liking the blog. Watched your YouTube channel- good stuff! Gonna keep my eye out for those water distillers....wow! Oh my...yes i remember those stirrers...and naive me had no idea what they became 'infamous' for...lol Great post! Shannon-Pretty crazy, right? Yet all true! Anyways, thanks for writing and enjoying the blog...Dude! Hey. I am a new ebay seller and blogger and have recently started reading your blog. 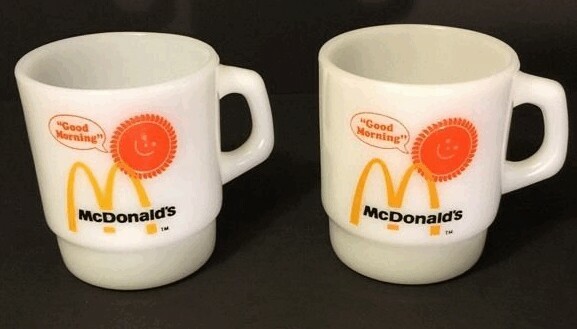 Love this one about McDonalds collectibles. I'm old enough to remember when they came out.Thanks for the memories. You can find me at collegefundthrifter.blogspot.com. Good luck with the blog, Nicole. Always can use more people sharing their ideas. I'll check it out....Dude! I saw some McDonald's Garfield coffee mugs at the Goodwill a few days ago. I was surprised they don't sell for more on Ebay; they seem to only go for a few dollars a piece. I know what you're talking about. I think overall, Garfield stuff just isn't that big with collectors anymore. Although the Garfield clock can still bring in over a hundred bucks. Other then that, eh..not so hot! Loved this story Dude!!! My favorite from McD's is actually a double cheeseburger..have those maybe a couple of times a year. However, whenever we drive to see my parents (they're in another state), we leave really early in the morning and stop and have breakfast there. I'm nuts about the sausage, egg and cheese biscuits. :) It's become a tradition. Margaret - The double cheeseburgers are awesome. They use to be on the dollar menu. Talk about a bang for you buck! I like their breakfasts too. The 99 cent sausage burrito is pretty tasty and you can't beat the price. As a matter of fact, Mrs. Dude and I were hurry on Saturday and had to be somewhere for a 1:00 PM meeting. We drove thru the Mickey Ds drive-thru and bought the two cheeseburger, fries and soda deal and ate it on the road. Five bucks spent and no growling stomachs at the meeting. Win-win! I may have to start a McDonald's fan club blog-Ha!